Attention Porsche fanatics and car enthusiasts! 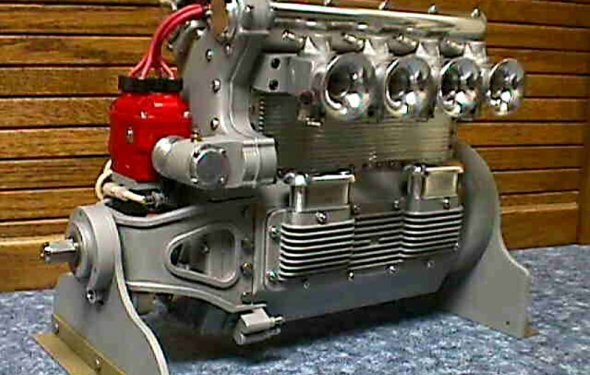 Ever wanted to build your own Porsche flat-six boxer engine but never had the time, or more importantly, the know-how? The people at Franzis have you Porsche fanboys covered with a detailed 1:4 scale model transparent engine kit modeled after the 2.0-liter 1966 911 boxer engine that features a motorized rotating assembly and an electric sound module with genuine flat-six engine sounds. The intricate air-cooled flat-six scale model kit also includes a spinning engine fan, transparent casing, cams driven by the belt, working, gear-driven distributor, timing chains (belts in the model), and LED lights that simulate the firing order of the spark plugs. The only tool needed is the supplied screwdriver for the many screws that come with the kit. Assembly shouldn’t be hard thanks to the supplied illustrated book made in cooperation with the Porsche Museum in Germany that provides instructions on assembly, history on the production of the Mezger engine, and historical photos, drawings, and posters straight from the Porsche archives. Once assembled, power the model up and watch the engine assembly rotate in the clear engine casing. This 290+ piece 1:4 scale model kit requires three AA batteries, but don’t worry about any glue, not needed for this superb flat-six scale model engine.